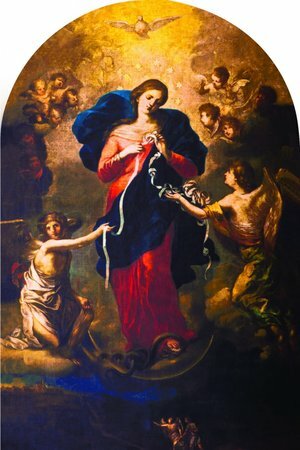 Here’s Day 1 of The Our Lady, Undoer of Knots Novena! Please bless me with a part time job from 9 to 1 PM, from Monday to Friday. I pray that I will excel in my job and have good rapport with my bosses and coworkers. Please bless me with many good friends who I get to see regularly. Please bless me with a happy and content marriage with my husband CJ. I pray that my husband will become more responsible and disciplined in matters concerning work and home. I pray for good health and healing in all members of my family including my Papa and especially my Mama who has Alzheimer’s disease. Mama Mary, please heal my mother. Bless her with a healthy brain now. I pray that you would bless my two sons, Dan and Mike, a successful scool year. I pray that they will excel in all of their school subjects. I pray that Mike will excel in reading and comprehension. I pray for financial freedom. I pray that my son Daniel will finally heal from eczema. I pray that my brother Ren will heal from psoriasis. Last but least, I pray for acceptance, tolerance, and positive interactions with every person, in all skin colors, I meet and encounter. I pray that my two sons and husband have the same positive experience. Thank you for listening and your blessings Mama Mary. Dearest Mary, Thank you for answering my prayer, I just called my nephew and he answered, did not sound so good, is severely depressed but we talked for awhile and his rash is improving. I feel much better now. Dearest Mary, I pray to you to undo the knot I have in worrying about my adult nephew who has addictions and many illnesses. He isn’t answering his phone, it goes straight to voicemail, when I saw him he had a horrible rash on his back, that is why I went to see him to bring him ointment for the itch. I just pray he is okay and taking care of himself. I try not to worry and think about it but it’s very hard. I’m going to leave it in your hands and the hands of your son. Lord Jesus,blessed mother I pray that you would untie the knot that is holding back my finances.i pray for money to pay my son’s tuition fees. I pray for money to meet my financial obligations. I pray my children ;my husband, my marriage and my family. Please undo all negative knots from our lives. Please bless my marriage. I pray for the healing and my heart and soul. I have been living a spiritually depraved life, shutting out people and any divine light. My whole being is collapsing at the core as a result and all signs point to repenting my wrongs, clearing my mind, body and spirit to let God in. My beautiful, courageous sister who is battling a serious disease put me onto the Novena and I surrender myself to the process! Thank you for all who are apart of this process! I love you! Blessed Mother I pray that you will undo the knots of my resentment, anger, and distrust. Replace them with love, compassion, peace and harmony as I struggle with my very troubled marriage. Our lady undoer of knots, please undo the financial embarrassment, I – 140 and 24th of May threatening my dream. I believe it’s already undone. For daughter. Sara…..who is living a very….immoral life…..rejecting anything spiritually healing ..surrounding herself with family members who applaud her behavior…I pray for protection for son Andrew who is 9 and very confused……Mary ..undoer of knots. Pray for us….. Please undo the knot(s) that are preventing the healing to my knees. I ask for your intercession most Beloved Mary, Undoer of Knots. Thank you. In Jesus Name! Host gracious Mary Mother of Jesus please pray that I can get my Assistance renewed without problematic issues. My wife and I are desperate for this assistance. Help me to change my attitude within our family so that we all move forwards. For Ireland’s upcoming referendum on the right to life for unborn boys and girls. For consolation for his family and the repose if the soul of George. For my husband, children, daughters in law, and future spouses and vocations of my unmarried children. In Jesus’ Holy Name we pray. Mother Mary I pray for my mother’s home care situation —for her safety and comfort. I am also desperate of guidance to find a common ground with my brother whom I am struggling to deal with his bad temperament that triggers my bad temper as well. I also pray for the family that are renting in my unit may they find a place that fits their needs and situations. Lastly, I pray for my own peace, hope and joy. Been sad and full of frustration for all the negative situations that I have been going through..
Oh Most Holy Mother of all , I beg for your powerful intercession. Dear Mary Undoer of Knots, pray to undo my financial knot. I am in great debt. Free me from this knot that is causing me great pain in my life and my family. Ask your son to free me from this knot. Give me wisdom to undo this knot. Thank you Mother of God. Pray for marriage restoration and healing . Please pray that my son be delivered from the throes of addiction and becomes the person God intended him to be. End this craziness of addictions. I pray that the government puts an end to all the shootings that are going on in the world today!! And that everyone in my family are forgiven of all of their failures including me. Amen!! please untie the knot of singlehood. I am 40yrs old and need a husband. I want to have a family and be able to have children and bring them up in the way of the lord. I have been mocked by my peers and family. please help me. Mother Mary, I pray for success of my pediatric board exam. grant me understanding as I study, guide and direct me to study the things that are on my exam. Please untie the knot of exam fear, distractions, lack of understanding and low self esteem. Conversion of my son and success in job search. Peace and Harmony among my grandchildren and their father. Peace to the families they live with. Blessed Mother you have never failed me. I have recourse to no one but you. Please intercede with your Son for me and all other mothers in similar situations to answer my prayers, if it so the Will of God. Please help me recover from type 2 diabetes and please forgive me for the many times I was upset and not patient with miele. She is the love if my life. Please untie her ailments so that she may live a long and healthy life. I pray for my relationship please undo the knots of confusion and dying love for my better half, I pray for a healthier relationship with my mother and all unclean thoughts. I pray for everyone that their knots be undone. Amen. I pray that the knots of addiction that are holding my children and myself hostage be freed. I pray that the knot that is the judge for my second oldest be freed so that he may be sent to Sheridan Oregon instead of any place in Colorado to serve out his time. I also pray that his alcoholism is taken away for the rest of his life so he can be a good father and provide for his kids. I pray that my oldest is freed from addiction so that he may live a productive life and be a good father to his children. I pray that my daughter is freed from addiction so that she may have a healthy pregnancy and a productive life to make a living for herself and her baby. I pray that the knots of guilt and regret I have be freed so that I may meet all the goals that I have set for myself and to keep addiction away from me for the rest of my life. Thank you. All this I ask in Jesus holy name. Amen. Mary, Undoer of Knots, please help me out of my job situation. It has been such a source of stress and anxiety for me and I know I then carry that home to my family, who deserve my best self. This new job opportunity seems like an answer to years of prayer, but I am very scared to make a change and leave stability for the unknown. Please help me through the process, guide me, and God’s will be done. relationship has a long, long way to go. Mary mother of Jesus please pray for my marriage ,Home ,family. May all the knots of anger, spirit of not forgiving & holding onto grudges be untied. Help me to let go & let God. Amen. I’m asking our lady to remove the knot they is keeping me back, from testifying about what the lord is doing for me, and what he has done for me. Mary undoer of knots,pray for me. I pray for the knots of physical and emotional abuse to be undone in my family tree and most specifically in my daughter and in myself that we may be healed from all grief , shame and guilt in our bodies, minds and soul so we may rest in the protection of Jesus and Mary’s divine mercy. Mother, I pray for relief from continual financial burden and ask an abundance to be poured out, enough to pay off my debts and still be able to bless others. I pray that you help my daughter find her way out of her current relationship. Send her a Godly husband to be a soul mate, help her raise her son, and to give her more children, as is her heart’s desire. Please bring a good wife to Aaron to ease his lonliness and allow him to start his own family. I also ask for a spiritual renewal for my two other sons, so that they and their partners would desire the holy sacrament of matrimony, and would be Godly examples for their children. I bless you sweet mother and thank you for your care. Our Lady,undoer of knots. Please undo the 18th of May knot that is threatening my future and wellbeing. I believe it already has been undone. Amen. I offer this Novena for my daughter and her husband whose marriage is in distress. I pray that through the intercession of Mary Undoer of Knots, their marriage will begin to heal. Blessed Mama Mary, you are the undoer of all knots no matter how tangled, gnarled and hardened with age. I lay at your feet the ribbon of my addiction to co-dependency. Please deliver me from this lifelong addiction through your powerful intercession. Ask your beloved Son our Lord to grant me the graces needed to heal the hurts I have caused and help me repair relationships with friends, family, pastor and co-workers until they are all healthy and loving. In the name of the Father almighty, his Only Son our Lord the Redeemer, and the Holy Spirit who moves within all of us. Amen. I pray that my husband finds a job, to use his talents, to lead and help our family and help us out of homelessness and to repair our financial losses. 1. I pray for the untying of my spiritual blindness and deafness. 2. Grace and assitance to turn away from temptations of this world especially the flesh and pride. 3. For my wife, marriage and kids. 4. To completely trust Jesus and his ways vs mine and to surrender myself to His will completely. 5 For my daughter’s conversion. 6. For Peace no matter what is going on. Mary, Untier of Knots, Pray for us! Mary, Mother of all. Bring peace to my heart, end this madness in my life, bring peace to my heart. Mary undoeer of knots please undo the stress knots that are causing my daughter sickness in body mind heart soul and spirit and heal her brain from all diseases to her brain and her body . I ask with all my heart to heal my daughter and protect her from all her enemies visible and invisible. I ask knowing that you will intercede for my daughter in all that is causing her stress and worries. Mother Undoer of knots pray for us. Mother Mary undoer of knots heal us . Blessed Virgin and Holy Mother please reduce my anxiety and stress and give me hope for my husband’s appointment on Thursday. Bless all my family and that Geraldine’s anxiety had reduced due to her faith in you and your son Jesus Christ. In the name of the father.Amen.